pH is one of the critical elements that your pool maintenance program needs to get right. Too far towards either the acidic or basic ends of the pH spectrum could cause both swimmer discomfort and damage to the pool. The instructions on the sides of our kits are simplified reminders of the procedure for advanced users (see image below). These are the extended instructions for the rapid pH Test Kits that give you all the nitty gritty details on how to test your pool for pH levels. Rinse the pH viewing tube with pool water. Fill the pH viewing tube with pool water, to the mark indicated. Add two drops of pH Detection Reagent. Replace the lid on the reagent immediately to extend the life of your kit. Mix the pH viewing tube thoroughly, and compare the colour to the coloured blocks on the tube to determine the pH. Note: pH below 6.0 will read at 6.0. pH above 9.0 will read at 9.0. 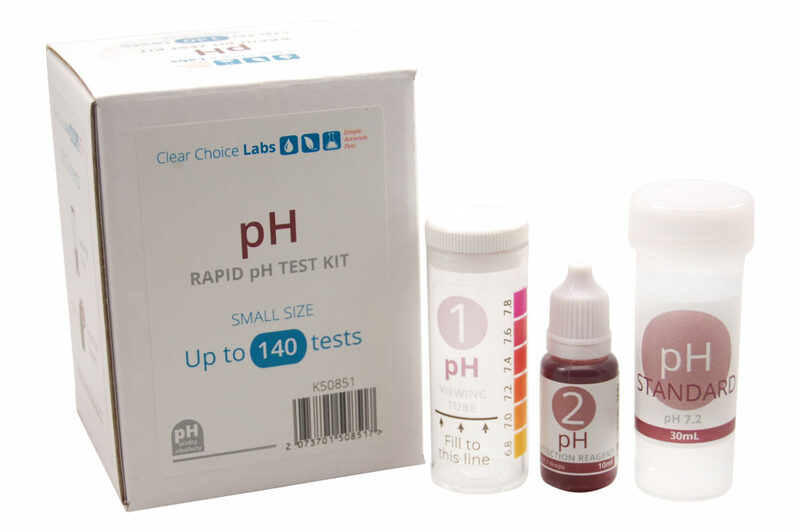 Note: Like most pH tests, the Rapid pH Test Kit will be inaccurate at high levels of free chlorine (FC). Above 10ppm of FC, the pH will read higher than true. Above 20ppm of FC, the pH will read at 9, no matter the actual level. Dispose of the sample safely. Do not pour the sample and chemicals back into the pool, instead pour down the sink with some running water. Rinse the sample tube with tap water and store the kit in a cool, dark, and dry place. Want a printable version of these instructions? We have you covered! This entry was posted in Instructions and tagged pH, testing, the basics. My q is shld I use 6.0 or 6.8 as the guide ? And also that values outside the ranges of 6.8 to 7.8 cannot be read – is that correct ? Hi David great chatting to you on the phone earlier. As we discussed, yep the test goes down to 6.8 and anything less than 6.8 will read as a colour lower than 6.8. Each of our tests except Chlorine, comes with a “Standard” which is water calibrated to a specific amount of the chemical being tested for. In the case of the pH tests, the other liquid is a sample of pool water which is at a set pH as listed on the label. This is useful in case you want to check your testing method or the reagents against a known level of pH. I find matching the colour to the values of pH 7.4, 7.6 and 7.8 very difficult as depending on the lighting, background, etc. the shade of the solution can look like each of the three squares. Any suggestions for how to best view the test cylinder to accurately determine the pH? Your manual gives a link to the pH rainbow but it gives a 404 page not found error. The pH test is a bit subjective, we find holding a piece of white paper behind the tube will help standardising the lighting situation. You can also check inside under lights if you like, as then the lighting is always the same. If you standardise the lighting and you’re still seeing it as possibly 7.4 through to 7.8, I’d treat your water as though it’s 7.6. Accuracy is important in chemistry, however the margins over such a large body of water are enough that one step either way on a test will not impact the results significantly. As you test this year, keep the results logged and you’ll see if any patterns develop which will help you fine tune your results even more as well.